Home › Home and Kitchen › Knife Set - 5 Piece Stainless Steel Kitchen Starter Knife Set - Chef Knife Br.. 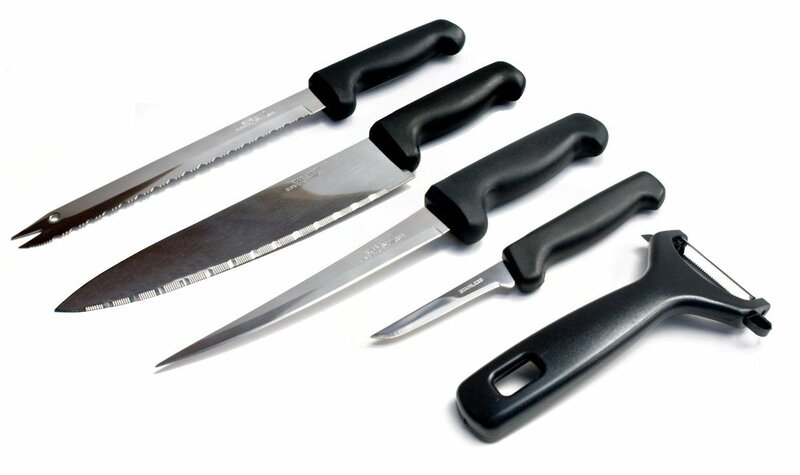 Knife Set - 5 Piece Stainless Steel Kitchen Starter Knife Set - Includes8-inch chef's knife, 8-inch bread knife, 3-inch paring knife, and free bonusswivel peeler. Superior High-Carbon Surgical Stainless Steel blades providemaximum sharpness and edge retention. Comfortable handles makes chopping,mincing, slicing and dicing fast and simple. Free bonus fruit and vegetablepeeler with duel ultra sharp stainless steel swivel blades with built-inpotato eye remover and orange peeler. The perfect starter knife set for chefsof all skill levels.